Gas Assisted Injection Molding chairs have been produced successfully for the last 20 years. My company (Aco Mold) has recently supplied gas assisted molding equipment for a customer in Brazil who is making Stadium Seating for the 2014 World Cup. We also supplied all of the gas assisted molding equipment for the London 2012 Olympic Stadium Seating and the Kiev Stadium seating for the last Euro championships. We have one customer in UK who is making all polymer (PP) chairs for schools and offices using our equipment. The MOST IMPORTANT thing is to get the chair properly designed for the gas assisted injection molding process. However, it is very unlikely that it will be cost effective to modify an existing chair mold to a Gas Assist part. To get the best out of the process you would need to re-design the chair using a new mold tool. The use of "box beam sections" with gas assisted molding does enable you to reduce the General Wall Section of the part in many cases (stadium seating is a good example) which would offer a potential overall weight reduction. For an all polymer chair (i.e. with legs and seat / seat back all plastic) it is common to use a 5-15% GF PP to get the required stiffness to meet the various statutory tests such office / school chairs need to pass. 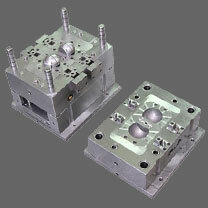 Certainly the use of Water Assisted Injection Molding can offer a potential cycle time reduction compared to conventional gas assisted molding, however, the main benefit of using water (improved plastic cooling) is also a limiting factor when the part has "attached wall sections" to the channels "cored out" by water. This is why the majority of Water Assisted Parts that are currently in Series Production are Media Ducts, i.e. pipes and tubes only with no attached wall sections. If you are using Engel equipment already you should speak to Engel about their "Water Melt" technology as I believe that have done several bottle crates using this technology. Regarding scrap rates using gas assisted injection molding, it is our experience that if the part and mold tool are correctly designed for the gas assisted injection molding process, scrap rates should be no higher than conventional injection molding.